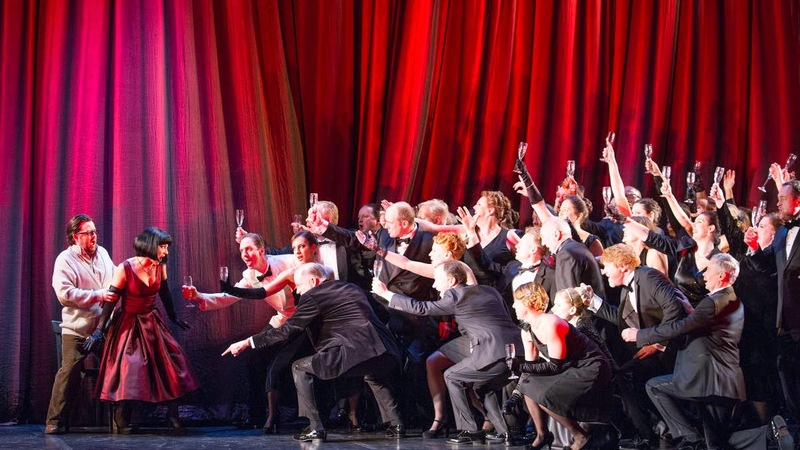 English National Opera's revival of Peter Konwitschny's production of Verdi's La Traviata had many elements in common with the production's original outing in 2013 (The production was a co-production with Opera Graz, where it had debuted in 2011). Ben Johnson and Anthony Michaels Moore repeated their performances as Alfredo and Giorgio Germont and the smaller cast members were the same. The production was revived by Mika Blauensteiner who was the assistant director on the original production. The biggest changes were that the conductor was now Roland Böer, and the title role was sung by the American soprano Elizabeth Zharoff. Konwitschny's view of the opera is stripped down, anti-romantic and not a little dystopic. The opera is cut so that it plays for just under two hours, without an interval. The biggest loss is the party entertainment in Act 2, scene 2, but throughout Konwitschny has tightened the focus of the work so that Violetta and Alfredo are even more the focus of attention. The advantage of losing the intervals is the concentration of focus, and the way the ends of scenes bled into the next notably the prone party guests from act two, scene two, crawling away from Violetta at the opening of act three. And the whole piece plays out against sets of red curtains, effectively this opera is set in the theatre. As the action progresses, curtains are opened so that more of upstage is revealed, till the very end when on a bare stage Elizabeth Zharoff's Violetta walked through the final curtain (an elegant metaphor, or a corny gag depending on your point of view). There are no props beyond a chair and pile of books, no stage setting, no frippery, no big frocks. The focus is on Violetta, and Zharoff was on-stage virtually the whole time. Konwitschny'sVioletta is a woman who seems to be acting all the time. Only at the very end does she take her wig off (a different one in each scene) to reveal her natural hair; her treatment by the Doctor (Martin Lamb) seems to involve considerable amounts of drugs - is she ill, or does she have a serious habit? She dies alone, on-stage, with the remaining cast members Anthony Michaels Moore, Martin Lamb, Valerie Reed (Annina) and Ben Johnson in the auditorium. So the focus is very much on the singer. In the 2013 production, Corinne Winters made a coruscating impression as Violetta, and if Zharoff did not quite match those memories she certainly took control of the role and blasted us with emotion. Zharoff has a surprising sounding voice. Looking through her resume she sings lyric roles with quite a bit of coloratura, offering Violetta, Marguerite (Faust), Pamina, and Constanze. But in the theatre her voice creates a big, vibrant impression partly because she has a significant and constant vibrato. I have to confess that I rather prefer a cleaner voice in this repertoire, but Zharoff made it work. She was adept at thinning her voice out at the top and producing a fragility which was essential to her portrayal. The fioriture in act one's Sempre libera were confidently done, she was expressive and there was never a sense of having to simply 'get through' the act. But with such a vibrato laden tone, inevitably the passagework does get occluded somewhat. This was a performance which grew. I felt that Zharoff was still finding her feet in act one, and there were tuning problems which will disappear. Dite alla giovine was beautifully crafted, but it was the final act which really moved, On a bare stage, with the action focussed on Violetta alone, Zharoff really held the stage and we appreciated the full emotional depth of her high-wattage account of the role. Ben Johnson's voice seems to have developed an even finer expressive sheen to it than before, this was one of the most beautifully crafted accounts of the role of Alfredo that I have heard. To a certain extent the timbre was at odds with the visual image, of the cardigan wearing nerd. But the very self-absorbed nature of this Alfredo certainly gets over some of the plots more ridiculous corners, you could well believe Ben Johnson's Alfredo not noticing obvious things like Violetta selling up. My emphasis on the beauty of timbre should not blind you to the emotional depth of Johnson's performance too. At the moment you are still aware of Johnson's careful control, you never felt he was in danger of letting go the way the greatest exponents of this role have done. But Johnson's achievement as young artist is superb and I look forward to hearing more of him in this repertoire (he will be singing Carlo in Verdi's Giovanna d'Arco at this year's Buxton Festival). Anthony Michaels Moore offered one of the most beautifully sung accounts of the role of Giorgio Germont that I have ever heard. Ramrod stiff of back, and clearly unable to communicate properly with his children, this was less of an ogre than a highly inhibited man. Sometimes I wished for a performance that was more rough-hewn, but listening to Michaels Moore's sense of control and intelligent understanding of Verdi's vocal line was a joy in itself. For much of his scene with Zharoff in act two, I had my eyes closed. Konwitschny brings Giorgio on with a young girl, the daughter to whom Giorgio refers, and too often during the Violetta/Giorgio duet it was the young girl who was the focus of attention. I felt I was being manipulated and did not like it. This is particularly true when, after getting worked up Giorgio strikes the girl. An act which leads directly to Violetta's giving an and Dite all giovine, but surely a falsification of the emotional core of the scene. The smaller characters were all strongly etched, even through the cuts. Matthew Hargreaves made a strong Baron and very much a nasty piece of work, Clare Presland was a party-girl Flora and Valerie Reid was a capable and sympathetic Annina, with Paul Hopwood, Charles Johnson, David Neman and Paul Sheehan. Seeing the production again, it struck me how hard edged everything is. None of the subsidiary characters are likeable and the party scenes are positively toxic, why would anyone put up with these friends. They make Ben Johnson's nerdish and inhibited Alfredo look positively normal. What also struck me this time was the sense of being manipulated; as the production has become more familiar I could sense more the way Konwitschny was arranging things so that we had to react in a certain way. The production was sung in Martin Fitzpatrick's modern sounding translation, and diction was excellent. Conductor Roland Böer is music director of Cantiere Internazionale 'dArte in Montepulciano. He conducted a finely controlled account of the score. His tempi were on the moderate to fast side, and this was very modern Verdi without any of the sort of indulgence we might sometimes expect. Böer did allow room for the singers, and his tempi were not overly rigid, but his relaxations and rubatos were relatively small scale. He avoided being overly brisk, but I did want him to linger a little more, to love the music a bit more. That said, he drew a very finely expressive performance from the orchestra with some lovely spun out lines. This is not a neutral production of the opera (but then no production is), and it certainly explores the sorts of contemporary issues which interested Verdi. The composer wanted La Traviata to be a contemporary opera, something that can get lost in a big frock production. Konwitschny's approach raises all sorts of issues about what it is to be true to the composer's intentions. But he places a lot of responsibility on his cast and here, the revival cast were on fine form and created a thrilling evening of musical theatre that left you going home wondering and thoughtful (as well as humming Sempre libera).